Designers and developers at THAT!, have created a new worktop robot that has been designed to provide a more environmentally friendly way of cleaning the services within your kitchen and home using the power of UV light. 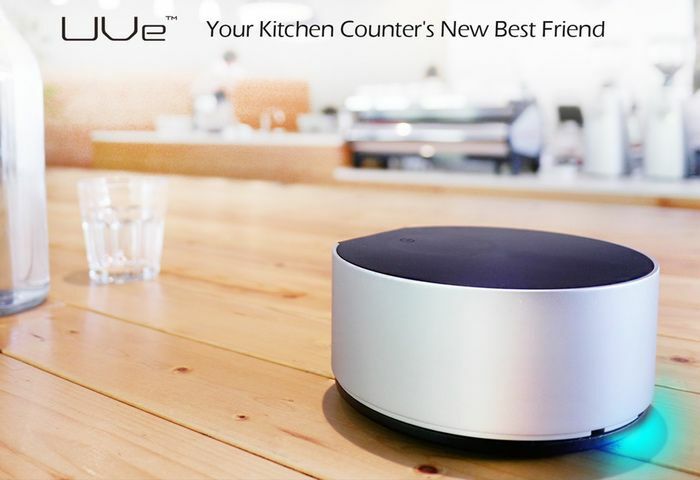 The small UVe robot is roughly the same size as a stack of CD discs and is capable of eliminating germs from your countertops or hard floors using the power of UV light and removing the need to use harsh chemicals on food preparation surfaces or within your home. Watch the video below to learn more about this fantastic little robot that is capable of carrying out its job autonomously and then returning to a charging point without any interaction ready for its next run. In the fight against germs, chemicals are our first and last line of defense. But in many of the places we need them most – like the kitchen or the nursery – they also pose the greatest danger. We rely on cleaning chemicals to keep us safe from dangerous bacteria, but they come with environmental and health risks of their own – risks that most of us accept simply because there isn’t a better alternative. But now, there’s another way: UVe. UVe is a self-driving, housekeeping companion that uses UV light to disinfect surfaces while you’re away, taking the work off your hands and leaving harsh chemicals out of the equation entirely. UVe was designed with a simple goal in mind: to help keep your home germ-free all the time, day in and day out – without the hassle and danger of using harsh chemicals. Uve is currently over on the Kickstarter website looking to raise $50,000 to help make the jump into manufacture and with still 43 days remaining on its campaign the small robot is already over halfway to completing its goal. Jump over to Kickstarter to make a pledge from just $84.